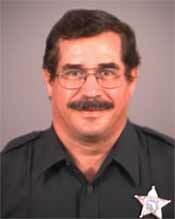 In 2005, BCSO recognized 3 Deputy Sheriffs with the 2005 Deputy of the Year for their heroic actions. Deputy Shannon Griffin, Corporal Brian Adams, and Deputy Barrett Bright were selected to receive this prestigious award for the incredible efforts to save three accident victims who had been trapped underwater in a canal along the Sarno Extension. Not hesitating, the deputies who were the first emergency responders to arrive, dove into the frigid, zero visibility water of the canal to attempt to extricate the trapped parties from the submerged and overturned vehicle. At significant personal risk to themselves, these deputies made continuous efforts to break out the windows of the vehicle, enter into the submerged car and attempt to locate the remaining victims. All three of the trapped victims were ultimately located and removed from the car. In addition to being selected as our 2005 Deputies of the Year, each Deputy was also recongnized with the Agency’s highest honor…the Medal of Valor. While enroute home at the end of his long shift Officer Stout observed an armed female in the Canaveral Road and East Railroad area attempting to kill herself. She discharged the firearm in an unsuccessful attempt to kill herself. She was in the process of placing the gun back to her head to attempt another shot when Stout intervened. Using excellent negotiating and communication skills, he was able to talk this individual into putting the weapon down. After which, he was able to safely take her into custody without harm to himself or the young lady. 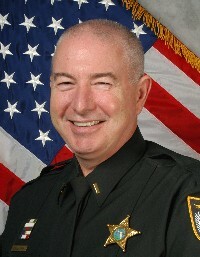 In addition as being selected as the 2005 Corrections Officer of the Year, he also has been recognized as the runner-up for the 2005 Corrections Officer of the Year for the entire State of Florida by the Florida Sheriff’s Association; and as Police Officer of the Year by the Brevard County Association of Chiefs of Police. In March 2005, Eryn was asked to convert the old jail training records, which were located on floppy disk, to a computer program that would streamline entry and retrieval information of the training records at the jail complex. In a very short period of time, she created and designed a very user-friendly computer program. With this program, training information can now be entered faster with less work, certificates for attendees can be automatically printed, class rosters generated and individual and class records accessed …all with minimal work by the person needing the information. If not for the improvement created by this individual, an additional position would have been needed costing citizens’ money unnecessarily. Eryn is widely recognized by those that work with her as one who is always kind, always friendly and always gives 100 % to help others. The Lucy Ross Award is presented to the employee (sworn or non-sworn) who best exemplifies the outstanding qualities and spirit of our lost family member, Sergeant Lucille Ross. Throughout her career, Lucy demonstrated an unwavering dedication to community service and excellence in her profession. Lucy was a genuinely compassionate person who never hesitated to assist others in need, regardless of her relationship to them or their station in life. This quality was most prevalent when dealing with crime victims or their families. Despite the rigors and demands of her work, Lucy could always be counted on to arrive with a cheerful disposition and work without complaint. Lucy can most adequately be described as possessing the unique quality that allowed her to make people feel better, regardless of their circumstances. This award recognizes the BCSO family member, who throughout this year, has best honored Lucy’s memory by demonstration of these same qualities and has been nominated by his or her co-workers. Lieutenant Qualter has devoted most of his 20-year career to handling child abuse issues and investigations. For 10 years now, Mike and his wife Vicki have been involved with Helping Innocent Kids End Abuse Today H.I.K.E. A.T.
For several months in 2005, the West and Canaveral Precincts experienced manpower shortages for various reasons. Reserve Deputy Lewis never hesitated to work extra hours to assist in the coverage. 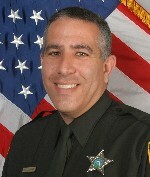 Since June 2005, Deputy Lewis has volunteered 454 hours to cover shortages on the road in West and Canaveral Precincts. He has issued 181 citations, 93 written warnings and arrested 20 individulas for various violations. In an effort to better his patrol capabilities, David has recorded an additional 40 hours of training. All this is being done in addition to him working full time at his civilian job. Deputy Lewis comes to work with enthusiasm and without complaint. He is truly dedicated to the Brevard County Sheriff’s Office. 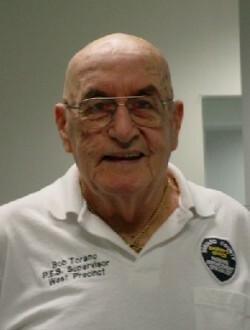 Robert “Bob” Torano is a citizen volunteer at the West Precinct. He has been involved with the Sheriff’s Office since 1999 and has dedicated hundreds, if not thousands of hours to this office. Bob spends the majority of his time working the desk, but very capably performs a variety of important tasks in the community and around the precinct. According to his co-workers, West Precinct has become somewhat reliant upon Bob and when he infrequently takes “approved” time off, he is truly missed. 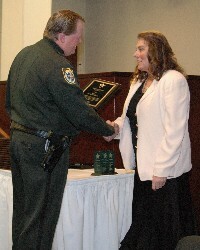 Each year BCSO recognizes a special person in our community who has dedicated their life in Brevard County to reduce crime, reduce juvenile delinquency and provide a better a safer Brevard County for our children. Jan Lokay, President of Crosswinds Youth Services was selected for this year’s Citizen’s Award. 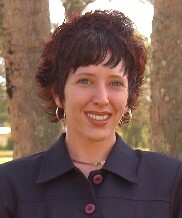 She has served as the President/CEO of Crosswinds for many years. Crosswinds was recognized two years ago as then best organization in America serving runaway, homeless, and other youth in crisis. Crosswinds was further honored by Governor Jeb Bush two years ago as “a rare type of non-profit organization. It runs itself with the precision and efficiency of a business while staying true to its core mission to help young people and their families… with life changing and life saving services.” Last year alone, Crosswinds provided services to about 4,000 Brevard County youth. The real key to the tremendous success of Crosswinds is the incredible leadership of the president of the organization. There is no doubt many children, most likely thousands, have been kept out of prisons or protected from harm because she is at the helm of this wonderful organization. These recipients were awarded Bar of Merit for outstanding duty performance. They have displayed unusual thoroughness, determination, and initiative while carrying out thier duties. Recipients of this award have helped members of our community when thier lives were at risk.